From my experience , I wanted to see and imagine what they where talking about , I have been working in films as a art director and it was challenging for me because I thought I knew my culture when I was growing up , but when I had to decide on a set ,it was hard to remember and I have forgotten a lot that are important and I needed to see in order to remember how it was made and how it was used and it would take time to organizes the set and when I had to do some research on how we have lived in the past . I would want to see a written document of each inujjaa ,that these are the original way of making the dolls and clothing . we are not just creating an idea because its art project , also there are only a few inuit today who can remembers how to make them. Rebecca Malliki : I remember when I was a child and visited a family who lived in a Qammaq ( sode house ) and hardly had caribou to hunt ,I remember they had only dog fur for clothing and bed covers It was because they had no caribou to hunt , when I was told to side on the bed side I did not want to because I was so afriad to sit on it . This project of inuuja is a great teaching tool for a workshop that involves our culture and to show the last three generations of the life we have lived and how it has changed, when there was little wood and metal available in inuit settlements, when most of the inuit still lived in sod houses and when only a few house where made. This project of inujja is a great way to teach our youth and children. All the inujja are made in different clothing that where tough by our mothers, to teach us how to measure and make the clothing, that has been passed on by our antcoistors and we use them for our clothing, this was the way they would teach the girls to know knowledge and survive in their environment, learning how to sew and make clothing and what were their responsibilities. 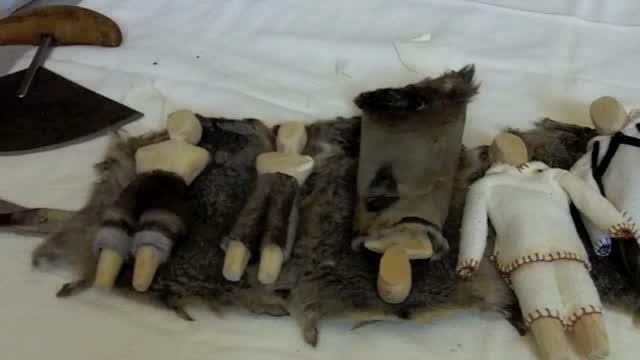 Inujjaa (inuit traditional dolls) that is made with small pieces of wood, bones and traditional clothing are the original inujjaa we would use, also the fur, bones and rock were the only one available for their toys. The one who is making the original inujjaa is measuring the clothing that her mother had tought her. This show a great way to learn and teach our culture. That is why I have decided to make the project of Inujjaa. 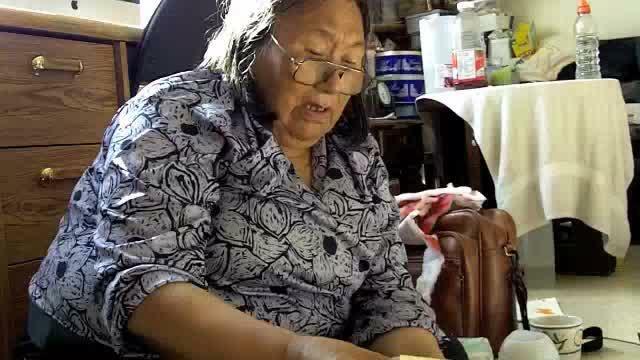 It was hard to get a new inujja because there was hardly any wood , when my father was making sled ( kamutti ) their would be small peaces and the wood was so breakable, my father made me one after he made the sled . Oh yes I can tell you what I remember. My mother's step sister Terase Kupaq had lots of inujja and they were properly dressed. I would cry because I wanted one. The step mother of Paula made me one and it was tall and thin. Rebeca starts to laugh .